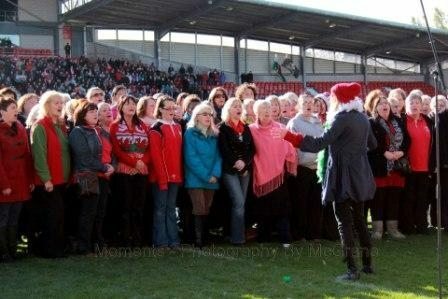 Wrexham Community Choir – One Voice Singing for All – met for the first time at the Wrexham Lager Club on 10th January 2012. With over 120 members, the choir membership reflects the mix of communities in the county and works to develop the choir tradition at the heart of Welsh history and culture. All welcome, especially beginners! We sing songs from all around the world in glorious harmony: traditional Welsh, pop, African etc. The choir has sung at arts events including the Focus Wales Festival and the Llangollen Fringe Festival, has run singing workshops across the community and has worked with incredible artists including Soweto musicians Africa Entsha with whom we are developing a long term partnership, celebrated Welsh poet Childe Roland, international sound artist Luke Jaaniste and the Wrexham band, Heal the Last Stand.